The October glory maple tree is actually a cultivar of the more common red maple, or Acer rubrum. These trees grow well under a variety of conditions, provide spectacular autumn color and bright red, showy fruit. As a hardy, all-purpose tree, it is hard to go wrong with this variety. The October glory maple is one of the most popular ornamental trees to be planted in private yards, roadsides and parks, and with good reason. 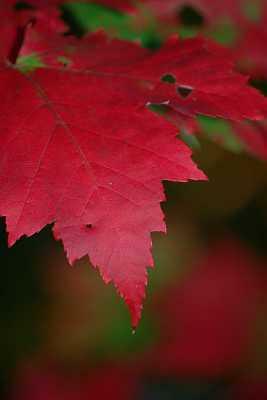 Its most distinguishing characteristic, its scarlet red autumn foliage, begins in early October, as the name suggests. The spectacular scarlet coloration persists for weeks, often after many neighboring species have already shed their leaves. Accompanying the striking foliage are clusters of shiny, bright red fruit that attract numerous bird species to your yard - a contrast to the usually drab brown keys most maples produce. Don't think the splendor of this tree is limited to autumn - the October glory maple is a stunning specimen all year round. In winter, the softly-hued gray bark provide a welcome relief from the drab monotony of darker trees, and in springtime the October glory bursts with color as it blooms with countless tiny but vivid red flowers. During the summer, the lush, dark-green leaves provide a hint of the brilliance to come. The crown of the October glory is roughly pyramidal when the tree is young, maturing to a moderately dense oval or circular shape at a height of 40 to 50 feet. The species may require some pruning, as the branches droop slightly and can obscure walking space if allowed to persist too close to the ground. Encourage the development of a single, upright leader and trim lateral branches near the bottom of the crown. This cultivar is reliably hardy from USDA planting zones five to eight, though it may be cultivated in as wide a range as zones three to nine with special considerations. If you are considering planting this tree outside of its comfortable climatic zones, ensure the individual tree you purchase originates from stock adapted to your specific conditions. There is a fairly wide degree of genetic variation among individuals, so some flexibility in site requirements is possible. Salt tolerance: Poor. If your tree will be exposed to excessive salt from winter roads, consider the crimson king maple as an alternative. While not as prone to root damage as other maple species, such as the silver maple or crimson king maple, the October glory maple still poses a potential threat to municipal waterways or adjacent roads or sidewalks. When in doubt, only plant this species where you are sure it will do no damage. The bark on this tree is uncommonly thin and easily damaged. This is especially a concern in the early spring, when the sap is running and the tree can easily 'bleed out' from a wound in the bark. Use extra caution with lawn machinery, automobiles, pruning shears or other equipment that might do damage to the protective bark. The beauty, practicality and flexibility of this cultivar has made it widely popular and readily available. As an autumn showpiece or a simple shade tree, the October glory maple tree is sure to please.